I pay scant attention to Melania Trump, keeping my (usually ireful) gaze on her husband. But as Christmas is one of the few things I like about winter, it occurred to me that if President Trump is serious about reducing trespassing on our soil, he could start with the first lady’s incursion on the American tradition of White House holiday decorations. 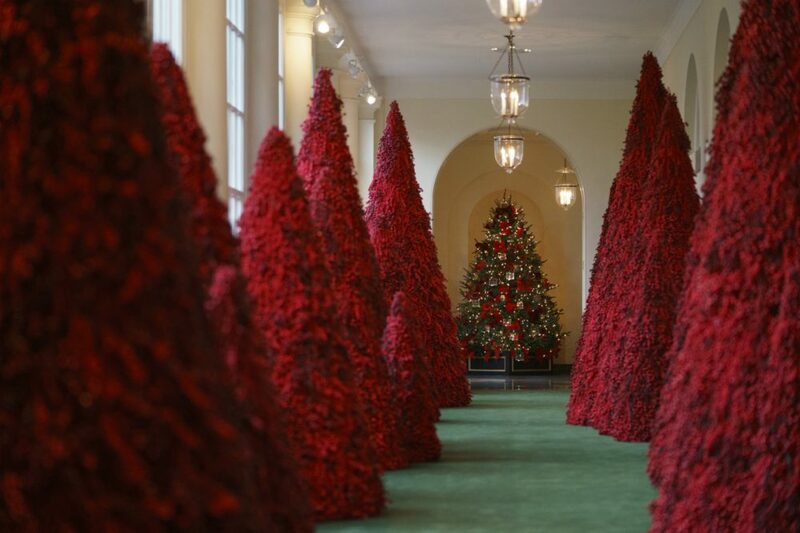 Twitter exploded last week over Mrs. Trump’s glittering red trees, which she called part of a “sparkling” Christmas but which conjured Stephen King for tweeters who referenced “The Shining” or were reminded of “pig’s blood, like Carrie.” This is the second Christmas that some have compared the FLOTUS’s decorating tastes to a horror movie. Let’s keep things in perspective: Mrs. Trump’s MAGA (Make America Garish Again) is less pernicious than her husband’s version. We’re talking home decor, not immigration or tax policy. And 1600 Pennsylvania Ave. is the Trumps’ home, unless and until Robert Mueller and Congress decide otherwise, so Mrs. Trump is free to decorate it however she wishes. Still, her towering imitations of Cousin It, smothered in satanic-hued berries, are of a type with the president’s obsession with all the glitz money can buy (indeed, with assigning a dollar value to everything, as when our Saudi arms sales outweigh a journalist’s murder.) If only she’d visited the annual recreation of a 19th-century New England at Old Sturbridge Village, Mass., the outdoor history museum. I recently did, learning how our domestic Christmas decorations evolved to their modern incarnation. Sturbridge shows that when it comes to festooning a room for the yuletide, you can succeed without aspiring to a crassly unlimited budget. Early Christmas trees didn’t even aspire to the ceiling. 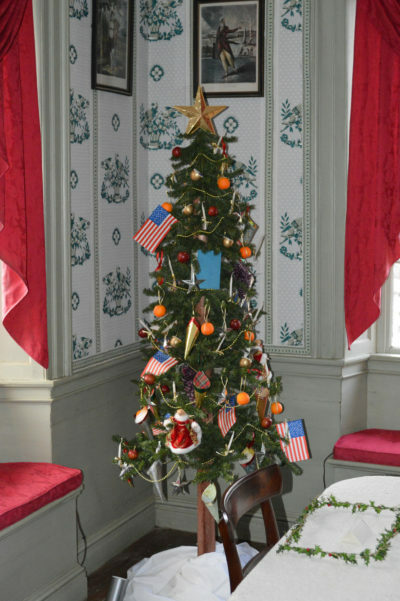 A couple of rooms in a Sturbridge townhouse showcase two-foot, table-top trees that were typical during the first half of the 1800s. There was little in the way of decorations beyond that, as Christmas was still not universally observed — a hangover from the Puritans, who frowned on what was, in their time, a day that was an excuse for drunkenness and violence. At least as late as 1895, the White House put up a table-top tree, larger and lusher than Sturbridge’s but still tastefully un-Trumpian. 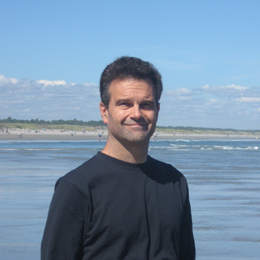 But even then, sapling-size was anachronistic. Walk up the hall at Sturbridge and you time-travel to the 1870s, by which time Christmas had become a holiday nationally, with expanding decorations one result. 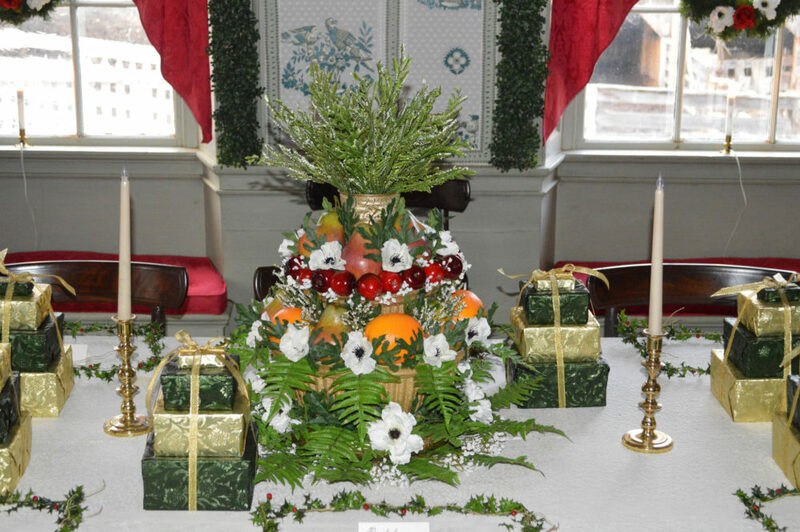 Sturbridge recreates a family dining room on Christmas Eve in that era, with a tree, perhaps six feet tall, standing on the floor in the corner rather than a table. It’s topped by a gold star and hung with dolls, oranges, beads and American flags (that should appeal to the White House MAGA crowd). It flanks a dining table brimming with wrapped presents, candles and greens. Candles by the windows illuminate wreaths affixed to the glass; an A-shaped greens arrangement on the wall. Mind you, I don’t object to her decorations out of any hackneyed aversion to Christmas commercialism. I have little patience for such grousers, clueless as they are that such griping dates back to before the Civil War, when reformers sought to replace the traditional holiday hooliganism that offended the Puritans with a domestic, gift-giving celebration. Commercialism was a step up. But like everything, it needs boundaries. Buying gifts? Yes. Tearing store workers from their Thanksgiving dinner to watch crazed shoppers trample each other on Black Friday eve? No. Trees (even several at the spacious White House) laden with pretty ornaments? Yes. The glimpse into Melania Trump’s id currently on display? Um, must we? At Sturbridge, the docent in bonnet and period dress who answered questions about the 1850s Christmas advised tourists to step into the 1870s room to see “Christmas gone wild.” I had to ask her: If the 1870s Christmas was over-the-top, had she seen Melania’s 2018 version?